S I G N & D I G I T A L G R A P H I C S • March 2019 • 51 Sign & Digital Graphics presents some of the industry's latest wrap projects. 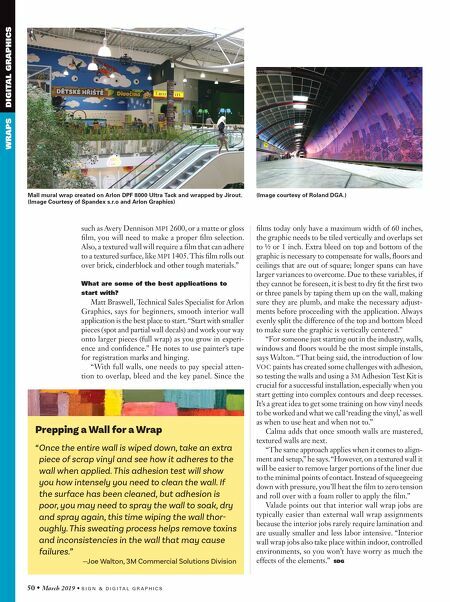 If you have a recent project that you would like to share, please send a sample of your wrap project to Matt Dixon at mdixon@nbm.com. 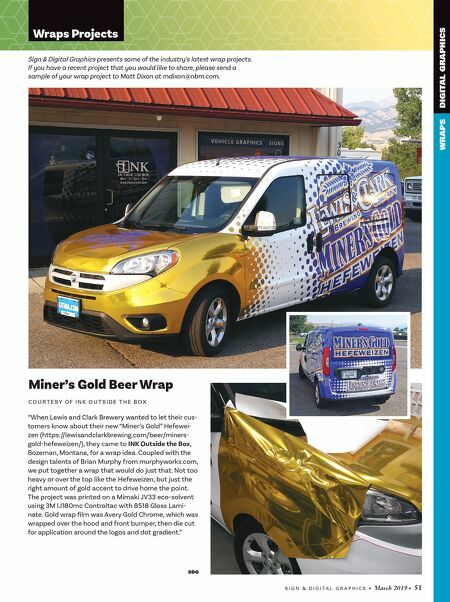 Wraps Projects WRAPS DIGITAL GRAPHICS SDG Miner's Gold Beer Wrap C O U R T E S Y O F I N K O U T S I D E T H E B O X "When Lewis and Clark Brewery wanted to let their cus- tomers know about their new "Miner's Gold" Hefewei- zen (https://lewisandclarkbrewing.com/beer/miners- gold-hefeweizen/), they came to INK Outside the Box, Bozeman, Montana, for a wrap idea. Coupled with the design talents of Brian Murphy from murphyworks.com, we put together a wrap that would do just that. Not too heavy or over the top like the Hefeweizen, but just the right amount of gold accent to drive home the point. The project was printed on a Mimaki JV33 eco-solvent using 3M IJ180mc Controltac with 8518 Gloss Lami- nate. Gold wrap film was Avery Gold Chrome, which was wrapped over the hood and front bumper, then die cut for application around the logos and dot gradient."